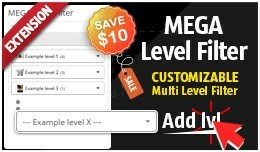 Mega Level Filter allows you to create the optimal structure of the filter levels, which will help your customers search products! In the admin panel you can create and manage groups of values at any level of the filter. 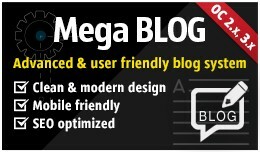 When adding value ..
Mega Blog is a module to easily present various types of news, articles and information about upcoming events in your online store! It will help you to stay in contact with customers, which will result with more website visitors and thus mo.. FEATURES This extension allows to restrict the visibility of selected information pages only for specific customers groups. REQUIREMENTS - vQmod 2.x extension DEMO - Backend - demo/demo SIMILAR EXTENSIONS: Customers Groups Re.. FEATURES This extension allows to restrict the availability of selected coupons only for specific customers groups. REQUIREMENTS - vQmod 2.x extension DEMO - Backend - demo/demo SIMILAR EXTENSIONS: Customers Groups Restricts .. FEATURES This extension allows to restrict the visibility of selected categories and products only for specific customers groups. DEMO - Backend - demo/demo This extension doesn't work with MijoShop SIMILAR EXTENSIONS for OC 2.x .. 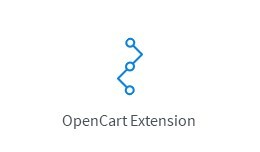 FEATURES This extension allows to restrict the visibility of selected categories and products only for specific customers groups. REQUIREMENTS - vQmod 2.5.1 extension DEMO - Backend - demo/demo This extension doesn't work with M.. 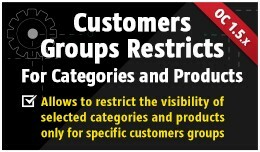 FEATURES This extension allows to restrict the visibility of selected categories and products only for specific customers groups. 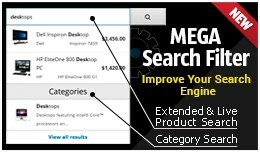 REQUIREMENTS - vQmod 2.x extension DEMO - Backend - demo2/demo2 SIMILAR EXTENSIONS Customers Gr..
Mega Filter PLUS is an advanced and user friendly filtering system. It allows efficient and fast products finding compatible with selected searching criteria such as attributes, options, filters, categories and many others. Each online store..
Mega Filter PRO is an advanced and user friendly filtering system. It allows efficient and fast products finding compatible with selected searching criteria such as attributes, options, filters, categories and many others. 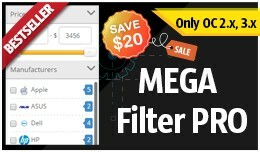 Each online store..
Mega Filter PRO [by attribs, options, brands, pr.. FEATURES - Support multi language - Support multi store - Automatic delivery notification - Fully configurable delivery companies and email templates - CKEditor in comment field (history order) DEMO - Backend - demo/demo If you li.. 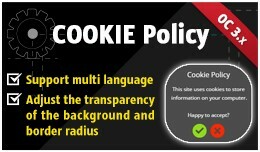 FEATURES - Support multi language - Adjust the transparency of the background and border radius - NO CORE FILES OVERWRITTEN POSITIONS - Bottom Left - Bottom Right - Top Left - Top Right - Bottom - Top DEMO - Backend - d.. Adds quantity selectors to: - Cart - Product Details - Product List by Category and Manufacturer - Search Results - Bestsellers Module - Featured Module - Latest Module - Special Module FEATURES - Should be compatible with almost any.. 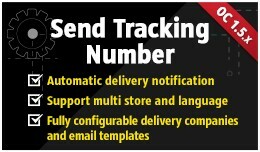 FEATURES - Support multi language - Automatic delivery notification - Fully configurable delivery companies and email templates - CKEditor in comment field (history order) REQUIREMENTS - vQmod 2.x extension DEMO - Backend - demo/dem.. 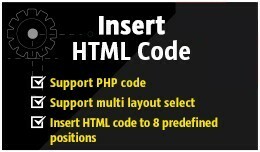 FEATURES - Insert HTML code to 8 predefined positions - Support PHP code - Support multi store - Support multi language - Support multi layout select - If you choose category layout, you can select categories for which the module will be a..